We provide multiple enriching programs to enhance our students' educational experience. We provide music for all of our students. Our Kindergarten and First Grade students are provided music through the District's Music Teacher Dorthy Caimano. Our Second Grade students are provided music through Thornton School of Music Teacher Marissa Honda. Our Fourth and Fifth Grade students are provided general music instruction through Education Through Music Teachers Kelsi Doolittle and Nadene Rasmussen. Norwood Band is lead by Kelsi Doolittle and Norwood Orchestra is lead by Nadene Rasmussen. The Early Language and Literacy Program (ELLP) is being implementing by all Kindergarten - Second grade teachers to ensure our students have mastered reading foundational skills and are reading proficiently by the end of second grade. We a Gifted and Talented Program where identified Gifted students are clustered and provided instruction that enhance and support students' gifted abilities. 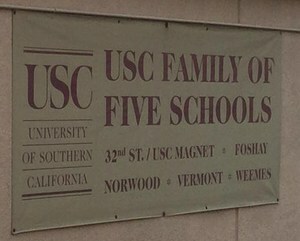 As a USC Family of Schools we receive multiple resources to support our students' academic achievement. Please click on the links to the right for more information about the programs we provide.